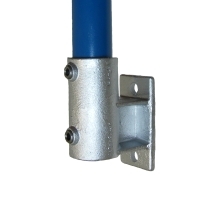 A palm-type fitting, often used to attach guard rails to upright walls, staircases and ramps. In standard form, the tube cannot pass through the bottom of the fitting, although the fitting can be modified to accomodate this at extra cost. Note: Access to one of the fixing holes is limited and may restrict the length of fixing that can be used. Dependant onload requirements type 145 may be used as an alternative.